Neuilly-sur-Seine, France, September 07, 2016 - Leading international classification society Bureau Veritas has recognised MSC Cruises with the2016 Special Safety Best Practices Award for the high level of voluntary-enhanced safety procedures implemented across its entire fleet. The Award follows the performance of additional drills witnessed by Bureau Veritas for better training and readiness of the crew in case of Fire, Damage Stability and Passenger Evacuation situations. This project, demonstratinghigh training skills and adherence to performing internal safety procedures over a continuous period, was initiated in 2012 and conducted by five BV survey centres in Europe, USA, South America, North Africa and Asia,covering the entire MSC Cruises fleet. Philippe Donche-Gay, President of Bureau Veritas Marine & Offshore Division says, "We are pleased to provide support and recognition for the extensive efforts and investments which MSC Cruises makes in safety, going above and beyond industry and international requirements." Emilio La Scala, President & Managing Director, MSC Cruise Management says: "When it comes to on-board safety, MSC Cruises will always strive to be at the forefront of innovation. We are thus highly honoured to receive this international recognition, as the safety and security of our guests and crew are and will always be our number one priority." 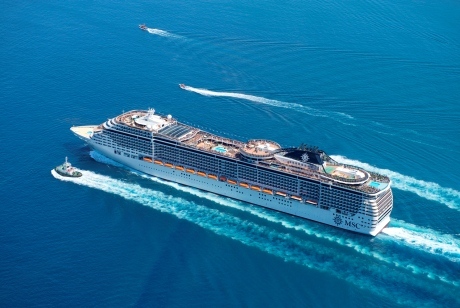 MSC Cruises previously won BV’s Seven Golden Pearls award when in 2013 BV recognised MSC’s commitment to safeguarding the marine ecosystem, as well as protecting the health and safety of its passengers and staff. The Golden Pearls award recognizes corporate compliance with the four highest international standards in the areas of environment (ISO 14001), health and safety (OHSAS 18001), food safety (ISO 22000) and energy efficiency (ISO 50001), together with the additional notation Cleanship-2-AWT, for the three domains of potential pollution: air, water and waste.